Once a month, I send Applied Tips to over 2500 subscribers. It is a monthly eNewsletter that delivers tips on Microsoft Word, Excel, PowerPoint, Access, and Outlook, plus a few added bonuses from month to month. 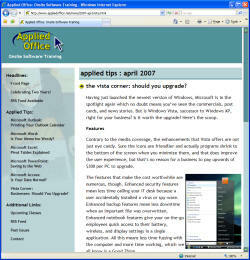 If you're looking for past issues, look at your recent copy of Applied Tips. There should be a link to the growing archive of tips and tricks. Can't find the link? Just contact me. Changing your email address? Contact me and specify your old and new email addresses. You can unsubscribe from Applied Tips at any time. Simply click the "Unsubscribe" link at the bottom of any Applied Tips eNewsletter, or contact me.